Large Outer Diameter. 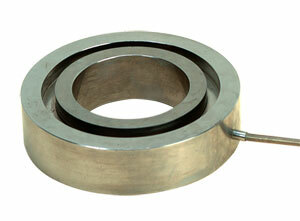 Through-Hole Load Cells, 2.00-3.13" (51.8-79.5mm) Internal Diameter. The LC8313, LC8400 and LC8450 Series Donut Load Cells are a space saving solution to applications requiring a large through-hole with limited space. With their rugged construction and design, these load cells are ideal for applications such as loading forces on large bolts or other suspended load applications. This series, with its all stainless steel construction and environmental protection, has proven its reliability in tough industrial applications. Nota: All LC8000 series load cells include a NIST traceable calibration certificate.